As standard across all models is Dolby TrueHD, Dolby Digital Plus, Dolby Digital 5.1 and DTS 5.1 all decoded via Bose proprietary technology, except for Dolby TrueHD, which is decoded by a TrueHD decoder. All three feature RF remotes, amplification, 5.1 speaker system, ADAPTiQ automatic room equalization, and source switching that includes four HDMI 1080p inputs, up from two in the Lifestyle systems that they replace. The Lifestyle T20 is the only one with an embedded AM/FM tuner and tethered iPod dock. None comes with embedded DVD player or Blu-ray player. You can get a SL2 transmitter/receiver package to make the surround speakers wireless, sold separately. 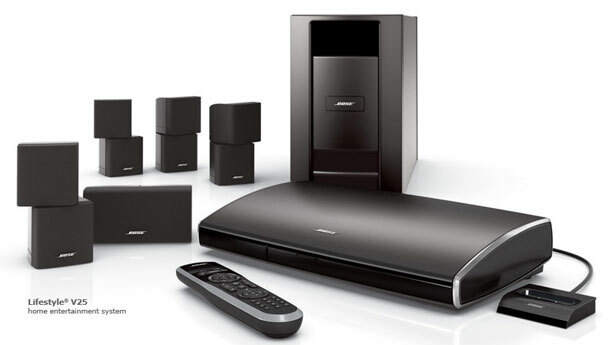 The system features Bose’s Unify Intelligent Integration System, which walks consumers through set-up steps displayed on a connected TV screen. The control console senses when a connection is made, and the display confirms that the connection was made successfully. The Lifestyle V35 and V25 come with universal remote with two-line display to display the name of a song or the radio station that is playing. The V35 features four 4.5-inch by 2.25-inch by 3.25-inch D Jewel Cube speakers and a horizontal center channel speaker. The V25 system features larger 6.25-inch by 3-inch by 4-inch Direct/Reflecting speakers. The T20 system also features 6.25-inch by 3-inch by 4-inch Direct/Reflecting speakers but lacks AM/FM tuner, iPod dock, and LCD display on the remote.